The first question to ask is why choose an active antenna over a good wire antenna? I have successfully used wire antennas all of my DXing life - that was for 30 years until I retired to this little town of Montagu in South Africa. Here I tried every combination of wire antenna with dismal results. I put this lack of success down to the rocky and stony ground and the fact that the area has a power supply of overhead street lines, plus a high voltage powerline in front of the house. I then bought a K9AY from Wellbrook, which, after careful installation and much e-mail between me and Wellbrook turned out to be a dismal failure. Andy Ikin of Wellbrook very kindly took it back and gave me a full refund. Now I had no antenna at all except an old Datong AD270 active antenna, which at least allowed me some reception. 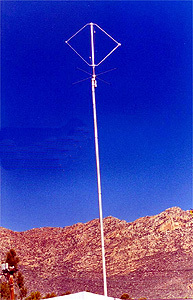 So I searched around for a better more uptodate active antenna and was impressed with the review of the RF Systems DX-1 Pro in the 1996 WRTH. I then enquired around on the web for user comments and finally Michael Schnitzer gave me a comprehensive and detailed review of the DX-1 Pro that encouraged me to buy one direct from Holland. It arrived and was installed in October 2000. From other users comments and carefully following RF Systems instructions, I installed the DX-1 Pro on a 5 meter pole mounted on an outbuilding. This was high enough to ensure the head unit was at least one meter higher than the offending powerline that had blocked reception of the wire antennas. Grounding was said to be particularly important, so I paid a lot of attention to that. The careful grounding ensures both a "ground" plane to the antenna and has a lot to do with diminishing the effects of local man made QRM. It also bleeds off and grounds the static that would otherwise damage any active antenna, something that is a real danger in the hot dry high winds experienced in this semi-desert area. Before choosing the final position of the head unit, I had an assistant walk around with my lightweight Datong active on a pole, thus allowing me to carefully choose the position with the least noise generated by my household and the neighbours noisy TV's and satellite dishes. Thus, the "head" unit ended up some 30 meters away from the indoor control unit at the radio in the shack. To minimise loss and ensure the least QRM pickup, RG213 cabling was used. Two "grounds" were provided, one at the head unit into a heavy copper cable at it's base, and another at the indoor control unit. These have proved very effective as the unit has not suffered from static damage in the strong dry winds and reception has been superb. The head unit may be described as having an "egg beater" configuration and is 1.25 H x 1.1 W meters. It has a very robust connection to the supporting pole and has withstood four years of high winds and lashing rain, some winds gusting up to 100 km/h. The indoor control unit is of modest size and has only two controls - an on/off MW suppression of 55 dB and a rotary attenuator control. This control allows attenuation of up to minus -40 dB in 10 dB steps and also +6 dB of boost. There is a LED to indicate power is on to the unit, but no on/off mains switch, as RF Systems state that it is built to "milspec" and is designed to be left "on" continuously. Two SO 239 outlets for two receivers are provided. The antenna is extremely quiet and seems to offer a lot of suppression to local man made RF noise, whilst at the same time being very sensitive. Sensitive and quiet enough to get those very faint DX signals from the corners of the globe. In practise I have never found it necessary to use the +6 dB of boost available. I must point out that my QTH of the little town of Montagu is far from being an ideal DX location, as it is at an altitude of 230 meters but surrounded by the 1400 meter high peaks of the Langeberg mountain range which tend to block out the incoming low angle DX from far distant stations. But when rare openings do occur, the DX-1 Pro has achieved results comparable with my seaside DXpeditions using 300 meter long beveridges. 10,320 kHz, AFN Pearl Harbour, 3 Kw TX power 18,640 Km's distant. I must stress that the above reception is only possible on an antenna that is both very sensitive and extremely quiet, which is the DX-1 Pro's characteristics. I can only wonder at what reception I would receive on this antenna if I was in a more ideal DX location. Visitors to my QTH remark on how quiet the system is and what a superb signal to noise ratio it has. The frequency coverage of the DX-1 Pro is from 20 Khz to 54 Mhz. It has an outstanding third order intercept point of +50 dBm and I have never heard of anybody reporting intermod or spurious signals on it. The receiving pattern is omnidirectional. So for four years I have experienced superb reception of the faintest stations from the furthermost parts of the globe on this outstanding antenna and would highly recommend it to any aspirant DXer. The caveat is that it must be installed exactly as per RF Systems instructions - that is high up and above the nearby roofs and trees, and properly and well grounded. As to the reliability, affter two years the rotary attenuator switch packed up. RF systems sent a replacement no charge that I replaced locally. After four years a simple $1 component packed up in the indoor control unit, probably due to the very high desert area heat here in Montagu. RF Systems would not supply the wiring diagram schematics to repair this locally, but instead sent a complete PCB board replacement, again at no charge. Passport to World Band Radio says in it's review of this antenna "it's unbalanced design makes it prone to pick up local electrical noise". On the contrary, in my noisy suburban location I find that in fact it suppresses this to a great extent. This is very apparent when I compare it with my Datong AD 270 active antenna that is extremely noisy by comparison. According to the review the DX-1 Pro is very expensive and not worth the money. I don't agree that it is not worth the money. If I want a fine cigar I will pay the extra for a Cuban, if I want a fine brandy I will pay the extra for a superb French Cognac. 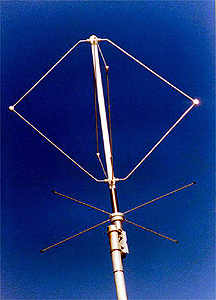 The DX-1 Pro, whilst expensive, is the best active antenna for the money and will yield superlative results. You will be better off with a Wellbrook ALA 330 or ALA 1530. To get the same results as the DX-1 Pro you are going to have to mount it on a rotator, as the Wellbrooks are directional antenna's. This is going to make it equal in cost to the DX-1. Also, from various reports, the DX-1 is far more robust for outside mounting. I have not seen reported results of Wellbrook antenna's exceeding the results I obtain on the DX-1 Pro. The DX-1 Pro is now replaced by the DX-1 Pro MkII. My DX-1 Pro was supplied by Deltron Trading BV, the Netherlands.